See more objects with the tag architecture, art deco, metalwork, gates, industry, machine. See more objects with the color saddlebrown grey dimgrey black dimgrey or see all the colors for this object. This is a gate. It was designed by René Paul Chambellan. It is dated 1928 and we acquired it in 1993. 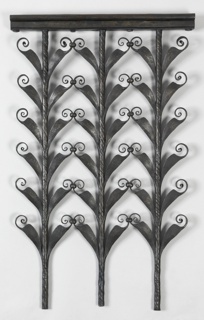 Its medium is wrought iron, bronze. It is a part of the Product Design and Decorative Arts department. 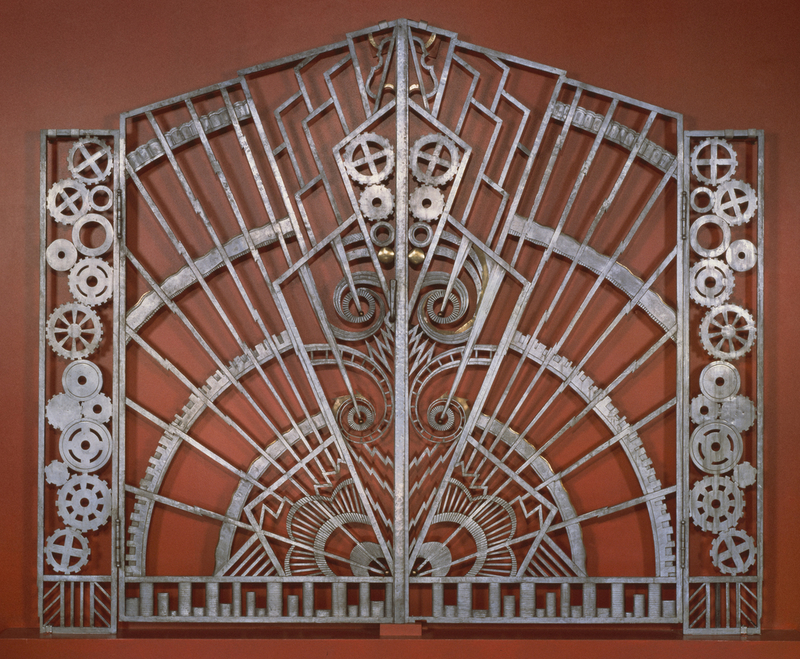 René Paul Chambellan designed these gates for the entrance to the executive office suite of the Chanin Building in New York. The radiating-ray design, which connects to Futurism and Cubism, is surrounded by decorative machine cogs, bringing industrial motifs into interiors a year after New York’s Machine-Age Exposition of 1927. This object was donated by Mr. Marcy Chanin. It is credited Gift of Marcy Chanin. 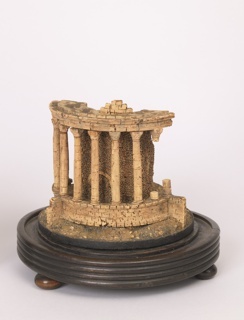 pressed, carved, and cut cork with wood base. Gift of Eugene V. and Clare E. Thaw. Museum purchase through gift of Mrs. Richard Irvin. This object was previously on display as a part of the exhibition	Opening Our Doors: Selections from the Design Resource Center.